It’s a winning combination that’s been earning well-deserved raves since Taverna opened June 30, and it’s yet further proof that some of the best restaurants in Southwest Florida are opening in Cape Coral. 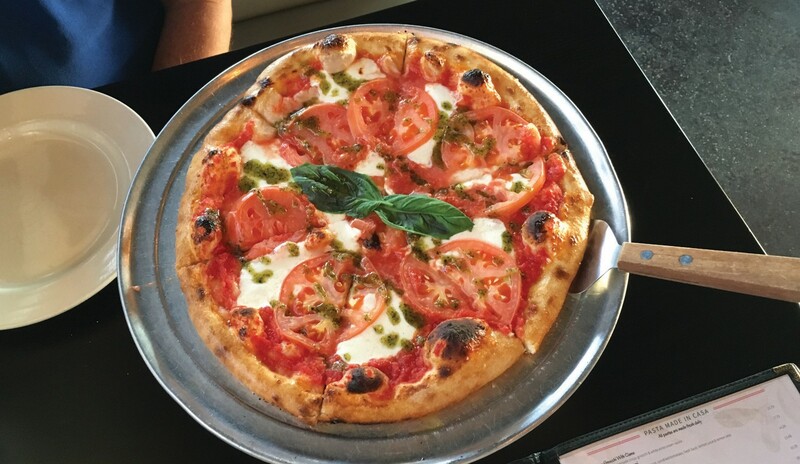 Indeed, Taverna’s culinary and management team migrated south to the former location of Seven Oaks on Miramar Street from Dante’s Coal Fired Pizza on Pine Island Road in the northern part of the city. The patio tables were not set up when we arrived, but it was too steamy to eat outdoors anyway. That open-air option should be popular when winter brings cooler temperatures. Indoors, it was quiet and cool, and K.D. Lang was serenading early diners through the sound system.It had only been a week and a half since Hurricane Irma shut down much of Southwest Florida, so it wasn’t too surprising to hear that only about 75 percent of the menu was available. It hardly mattered, considering the wealth of tantalizing choices still remaining: appetizers of creamy burrata breaded and fried, or Parmesan polenta draped in pesto sauce; entrees such as smoked chicken with sweet potato puree and a fresh take on pasta carbonara with Brussels sprouts, radishes, peas and fresh tagliatelle. 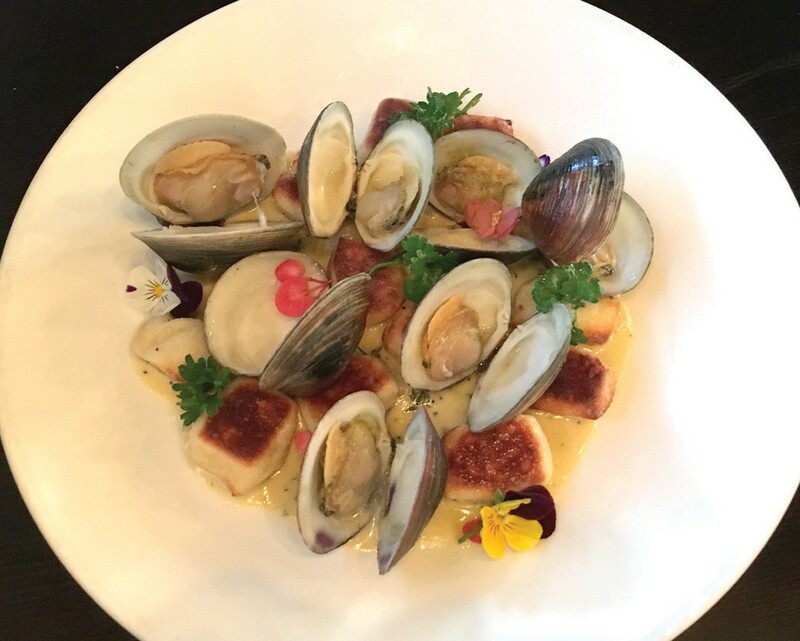 Crispy browned gnocchi, above, are nestled among plump clams in creamy sauce. 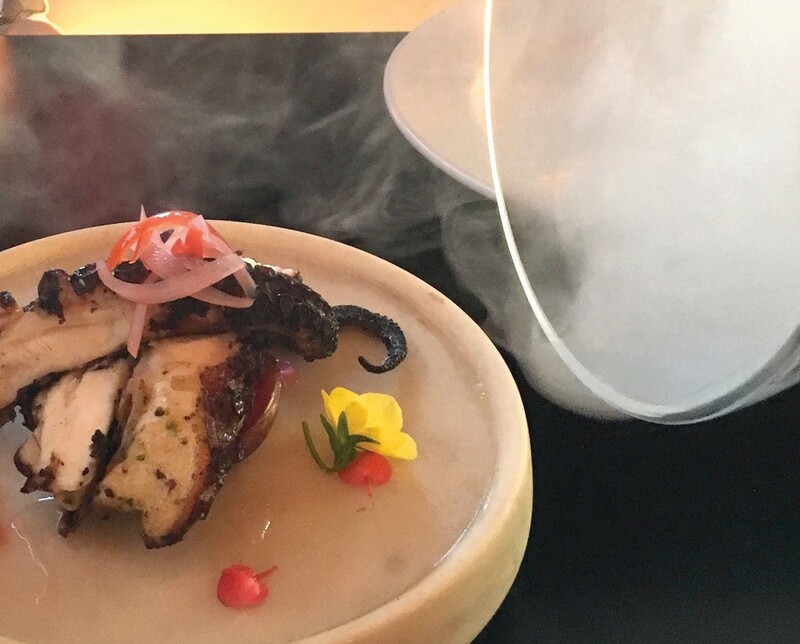 Smoked grilled octopus, above right, arrives under a glass dome filled with smoke. 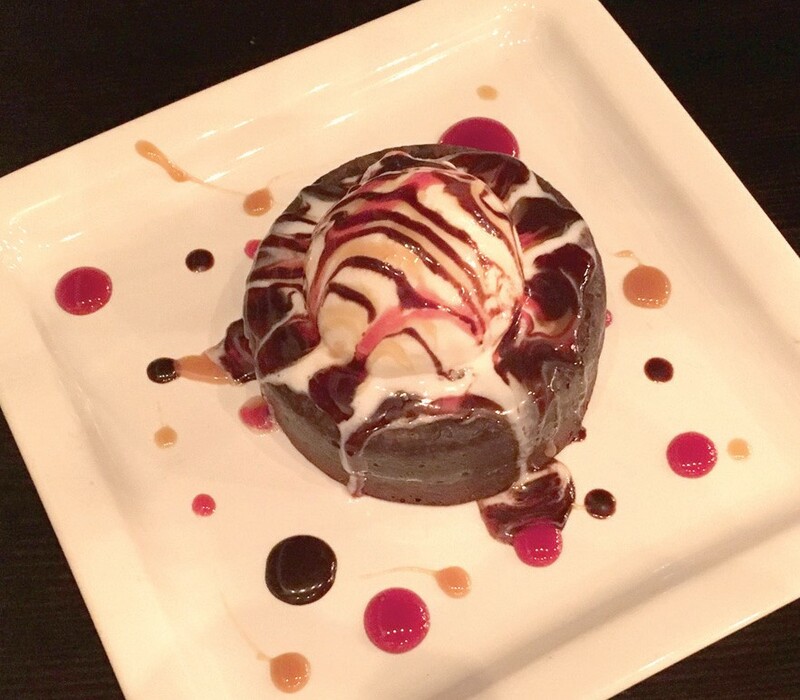 Chocolate Meltdown, right, is a lava cake filled with berry jam and topped with ice cream. Where to start? I arrived a little earlier than my dining companion, so I ordered a glass of Zenato Pinot Grigio from Veneta, Italy ($8) and a Margherita pizza ($11.99) so we’d have something to nibble on as soon as possible. 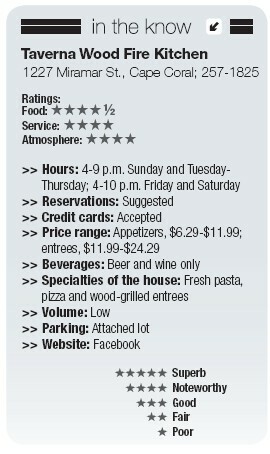 There are only a few wines by the glass — mostly Italian, along with a handful of well-chosen bottles. The beer offerings change regularly, and it’s nice to see as many craft brews on tap as there are mainstream beers by the bottle. In the kitchen, I could see a gentleman tossing pizza dough by hand, and the finished pie arrived not long after my companion did. The thin crust was blistered from the heat of the oven, with a little char on the bottom that I always like; the rim was a little thicker for easier handling. Although evenly topped with thin tomato slices. tomato sauce and fresh mozzarella, it was rather stingy on the fresh basil — and meager dribbles of pesto couldn’t quite make up for that. Want to create your own topping combination? There are plenty of gourmet goodies including arugula, burrata, gorgonzola, prosciutto and sopressata. For a showier starter, the smoked grilled octopus with roasted fingerling potatoes ($11.79) is a must-have. It arrives in a cloud of smoke under a glass dome that the server lifts with a dramatic flourish. Oh, the aroma that wafts over the table. And the beauty of the slightly charred tentacles and milky-white flesh garnished with pink pickled onion and red bell pepper and yellow and pink flower petals. It tastes as good as it looks — the meat is incredibly tender and smoky, and it’s paired surprisingly well with a berry compote. I’ve tried a lot of variations of trendy grilled octopus this year, and this is one of the best. Taverna makes fresh pasta daily for eight entrees from basic spaghetti with (veal) meatballs to shrimp with champagne butter sauce. One dish I’ve never seen locally is crispy gnocchi, here gently tossed with plump, juicy clams ($15.79). The little potato dumplings are browned, presumably in that blazing pizza oven, which imparts a caramelized crust to contrast the fluffy interior. So good — like a cross between mashed and roasted potatoes. A white wine-cream sauce infused with oregano, a nod to the classic clams oreganata perhaps — was so delicious we were compelled to wipe the bowl clean with bread.Moving on to the seafood section, there’s lobster fennel risotto accompanying perfectly seared sea scallops ($21.29) and colorfully embellished with red and black caviar. The rice had just the right creamy-cheesy bite, but the fennel flavor was mysteriously muted. Save room for house-made desserts ($7), which include Chocolate Meltdown, a lava cake whose richness was balanced by a tart berry jam filling, and a cannoli filled with pistachio-studded ricotta that wasn’t cloyingly sweet. It may sound oxymoronic, but even operating at less than 100 percent after a hurricane Taverna is still firing on all cylinders. © 2018 Taverna Wood Fire Kitchen, Cape Coral | Developed by our Website Design Agency - Everything 2 Promote.